11% Indiabulls Consumer Finance NCD - Feb'19 – Should you Invest? 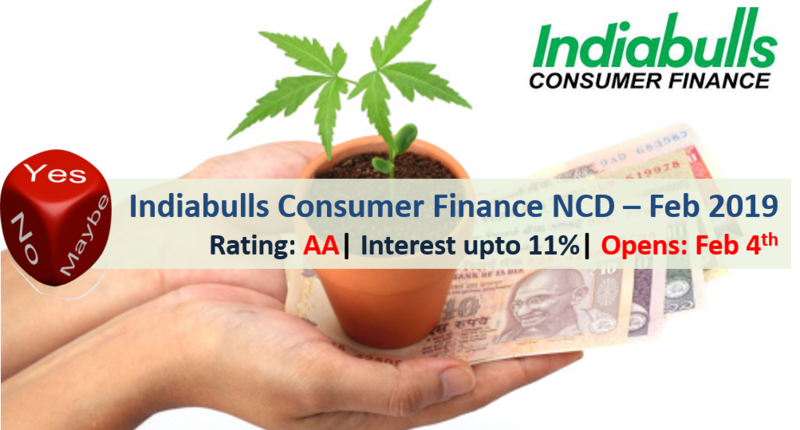 Indiabulls Consumer Finance Limited has come out with latest NCD (non-convertible debentures) offering up to 11% interest rate. The issue opens on February 4 and closes on March 4 , 2019. Indiabulls Consumer Finance Limited (IBCFL),formerly IVL Finance Limited is a non-deposit taking NBFC registered with the Reserve Bank of India and is a 100% subsidiary of Indiabulls Ventures Limited. There are 8 options of investment in Indiabulls Consumer Finance NCD. Indiabulls Consumer Finance NCD – Who can Apply? 10% Kosamattam Finance Ltd NCD – Mar/Apr’18 – Should you Invest? I am planning to invest in NCD. 1. What is about the Quality of various NCDs (Non-Convertible Debentures) of SERI Group (SREI INFRA & SREI EQUIPMENT FINANCE)? Why the Price for some of these 10 Yrs NCDs are falling like anything? Face Value of Rs. 1,000/- NCDs are selling at Rs. 820 / Rs. 800 or even lower. Is it advisable to buy 10 Yrs Maturity (say Maturity Date is in 2027 or 2028) NCDs of SERI Group or chances of Default is High? 2. What about various NCDs (Non-Convertible Debentures) of DHFL? Is it advisable to buy 10 Yrs Maturity (say Maturity Date is in 2028) NCDs of DHFL or chances of Default is Very High? Can NRI invest in this?